It's not too early to start getting ready for the next big solar eclipses coming to the U.S. in 2023 and 2024. NATIONAL HARBOR, Md. — It seems like it was just yesterday that the Great American Solar Eclipse of 2017 swept across the continental U.S., leaving millions of Americans in awe as the shadow of the moon momentarily turned day into night. While skywatchers are still raving about the amazing celestial event, it's time we turn our attention to the next big solar eclipses coming to the U.S., Angela Speck, co-chair of the American Astronomical Society's (AAS) Solar Eclipse Task Force, said during a presentation here at the biannual AAS meeting on Wednesday (Jan. 10). "We'll have so many materials between NASA and AAS, you're not going to know what to do with it," Speck said. Like they did for the last eclipse, NASA and AAS will provide extensive information about where, when and how to safely watch the solar eclipses. You can find maps, educational materials, events, information about safe eclipse glasses, citizen-science projects and more at eclipse.aas.org. 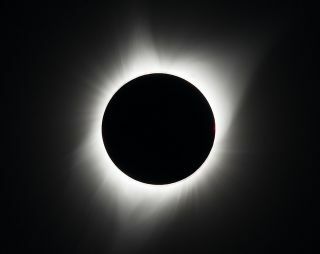 The task force also works with government agencies, state parks, departments of transportation and other organizations to make sure the nation is prepared for the massive influx of eclipse-gazers who will flock to the line of totality before the eclipse, causing potentially record-setting traffic jams. The next total solar eclipse to pass over the continental U.S. will follow a 115-mile-wide path from Texas to Maine. "On the one hand, we want as many people as possible to be in the path of totality," Speck said. "Those of you who have seen it know the difference … One of the things that we are trying to emphasize to people is that a 99 percent eclipse is not the same." Only in the line of totality will you be able to see the coolest parts of the eclipse, like the sun's corona, or experience the chilling, 360-degree sunset as darkness falls in the middle of the day. "At the same time, we wanted to be inclusive and get anybody who was anywhere in the country to be able to see this safely,"" Speck added. The next solar eclipse that will cross the continental U.S. will happen on Oct. 14, 2023, passing from Oregon to Texas. This eclipse won't darken skies the way the total solar eclipse of Aug. 21, 2017, did. Rather, this eclipse will make the sun look like a "ring of fire" in the sky, with the moon blocking only the center of the sun's disk. This type of eclipse, known as an annular eclipse, happens when the moon is at a point in its orbit that is too far from Earth to completely block out the sun, even though it passes directly in front. An annular, or "ring of fire" solar eclipse on Oct. 14, 2023, will sweep across the U.S. from Oregon to Texas in a 125-mile-wide (200 km) path. Just six months later, on April 8, 2024, another total solar eclipse will cross the U.S., following a path that stretches from western Texas to Maine. Just like with the last total solar eclipse, viewers outside the path of totality everywhere in the continental U.S. will still get to experience a partial eclipse, making this eclipse yet another nationwide skywatching event. To get a head start on making your own plans for these eclipses, start by looking at the maps and choosing a good location along the line of totality. Ideally, you should look for a place that tends to have clear, dry weather, where you'll have the lowest chances of clouds obstructing your view of the eclipse. Book your hotel as soon as possible to avoid any price surge in the months before the eclipse. Most hotels in the line of totality for the 2017 total solar eclipse were already fully booked by the end of 2016. You can save yourself some trouble by planning ahead, and the AAS Solar Eclipse Task Force is here to help. As we get closer to these two eclipses, they will continue to post new resources on the website, so be sure to check back periodically for updates.